Last year I purchased a used Hamplus AS82 2×8 antenna switch from a fellow contester. The specs are good and the brand seems to be in good regard. At first glance its construction appears sound and it is quite easy to wire up and use with a custom controller. That is, once I discovered how to drive the unit. Documentation is sparse and schematics do not appear to be published. From the start I had problems with it. I thought, perhaps, it was due to abuse, and I was unhappy that the seller did not disclose the problems. Due to the nature of the problems and his particular application it is possible he didn't know, therefore I will give him the benefit of the doubt. Regardless of this circumstance the problems are real and deserve an airing, since as I discovered the problems are inherent in the product. As the winter season progressed the problems became increasingly manifest. Perhaps the intense cold played a part -- it is mounted outdoors with a precipitation cover. Making trips outdoors at night with a flashlight when the temperature is -20° C and the wind howling to effect repairs in the midst of a major contest is not acceptable! However, spring warmth did not bring relief. As part of the re-cabling of the station this summer I had to repair the switch or replace it. It is critical to station operation. An antenna switch, even one designed for multi-op and SO2R antenna sharing, is not complex. The challenges are in reliability, electrical safety, fail safe to prevent one antenna being selected by both stations (lockout) and port-to-port isolation. I was not deterred by the lack of a schematic. While not intended as a review that is in part what this article contains. I'll relate what I discovered about the product as I searched for and repaired the problems I experienced. The process was educational. One antenna port (#8) could not be selected on one side since selecting that control line caused a power supply short. My power supply has electronic short circuit protection so nothing dreadful occurs. One side experienced intermittent disconnection or high resistance on most antenna ports. The other side had one non-functioning antenna port and one that was intermittent. The lack of a schematic I already mentioned. Fortunately the circuit is simple enough and the parts large enough that signal tracing and testing isn't too taxing an effort. However removing the PCB proved to be quite a puzzle. That is, it could be removed with some difficulty but I could see no way to reassemble the unit. Yet the PCB had to be removed to diagnose and repair the unit. In the picture notice the narrow opening between PCB and enclosure and the blocking of access by the vertical flange. 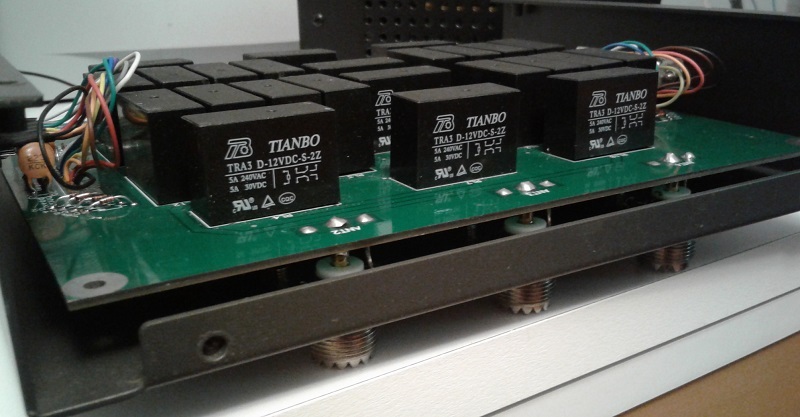 There are two sets of screws and nuts securing each of the 10 SO-239 UHF bulkhead connectors and the connectors are soldered to the PCB. The nuts are inaccessible except for one on each of the 6 outer connectors. 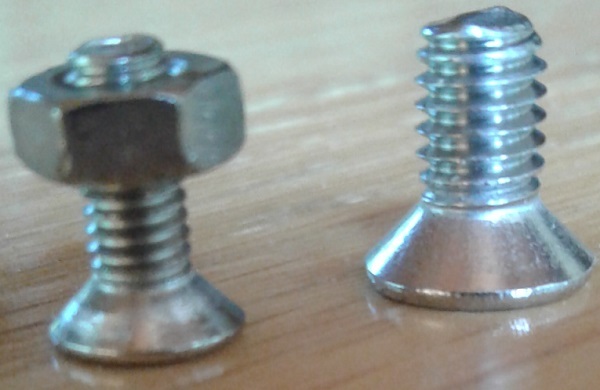 With some difficulty the nuts can be held in place while removing the screws. Holding them in place for reassembly is beyond difficult. I needed a better way, one decided before opening it up. After some thought I tentatively chose a technique that would work. I asked some friends if they had any better ideas but none was forthcoming. That convinced me to proceed on my chosen path. Since the product is made in Brazil it is not surprising that metric fasteners are used on the SO-239 connectors. Despite the connectors being specified in English units -- the flange holes are ⅛" (~3.2 mm -- the 3 mm stainless machine screws and nuts are a comfortable fit. The screws have bevelled heads to seat within countersunk holes in the enclosure. The screws provide the electrical connection between the connector flanges and the enclosure to ensure a continuous ground plane. A narrow steel tool was slipped between PCB and enclosure to jam the nuts against the connector bodies. Most screws had to be loosened this way. The quality of the stainless steel alloy is so soft that several screw heads (Phillips) stripped under moderate torque. These were drilled out on a drill press. 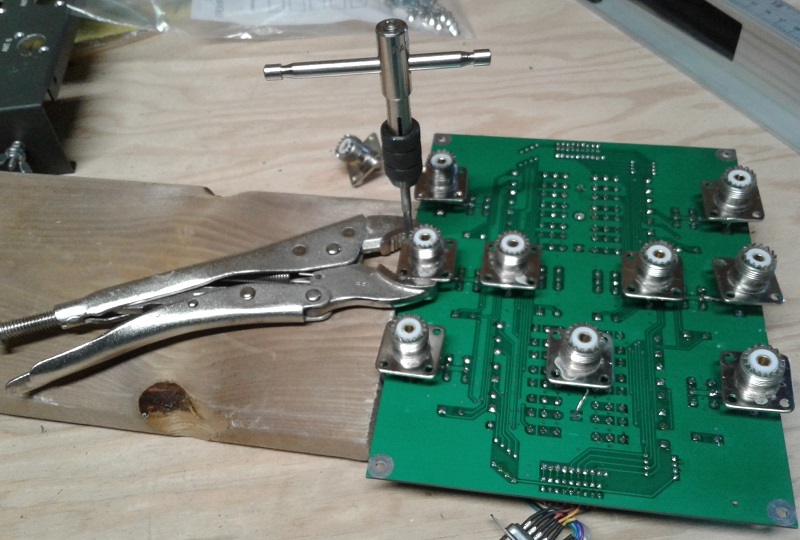 I elected to tap the connectors so that nuts are not required to secure the PCB. It is not an ideal solution because the metals used in SO-239 connectors are not designed for this usage it. But it does work. The base metal is typically brass with thin nickel plating. Tapping removes the nickel within the flange holes and so cuts threads into the base metal. Some care is required to avoid stripping the threads when tightening the new screws. Lubricating the threads can help to avoid excess torque for future removal provided that the lubricant does not prevent a low impedance path from screw to flange. Dielectric grease may be a good choice. The smallest standard screw sizes that will do the job are either #8 or 4 mm. A #6 screw will dig into the nickel a small amount, even without tapping, but it is not enough. Tapping the flange holes for either #8 or 4 mm does not require drilling the holes to a larger diameter since the metal is soft enough for the tap to bite in. As you can see in the picture I was not concerned with cosmetics since the flanges are not visible when the unit is assembled. Where you must be careful is to keep the tap at a right angle to the flange surface so that the threads are not cut at an angle. The flange is thin enough and the metal soft enough that this is an easy mistake to make. I chose 4 mm screws for this project because of the local fastener emporium's wide selection of metric stainless steel machine screws. I could choose the perfect length to fully pierce the connector flange without getting near the PCB. Also, my metric taps get very little exercise! I widened the enclosure holes for the larger screws using a large drill bit -- visually similar angle on the screw bevel -- to broaden the countersunk holes. When all was done it was easy to fit together the PCB and enclosure and use the new screws to hold it all together. Mission accomplished. Did you notice that there's a connector missing in these pictures? When I removed all the fasteners and lifted the PCB from the enclosure that connector fell off. Both solder joints had failed. That certainly explains the observed intermittent behaviour of one side of the switch! Each connector has two wires attached. A stranded wire is soldered to the centre pin and pierces the PCB, soldered to pads on both sides of the PCB. The hole is much larger than the wire so there are collars to bridge the gap. You can get an idea of the arrangement from the pictures shown above. A solid wire is encased in a large blob of solder on the flange surface and pierces the PCB in the same manner as the centre pin but with a narrower hole. This wire is quite fragile and prone to fatigue and breakage as the connector wiggles on its wire supports. The wires are only protected when the connector is screwed to the enclosure. In a couple of case the solder blob did not hold the wire securely and broke off, and another broke during repair. The wires are not mechanically connected to the connector flange; solder alone does not make for a reliable connection. Fasten the connectors to the enclosure with the screws and nuts. Solder wires to the connector and position them in alignment with the PCB holes. Place the PCB on top of the connectors and wires and solder them to them PCB. Otherwise they must have special tools for slipping in and holding in position the nuts for the connector fasteners. Either way this is not a product intended for servicing by the owner, and perhaps not even for servicing by the dealer. It is therefore highly unlikely the previous owner had disassembled the unit. There is also no evidence of modification or post-manufacture soldering. I replaced wires that had broken off from the pins and flanges. To ensure the affected connectors would sit flush on the enclosure I used the new screws to secure the connectors to the enclosure, sat the PCB over them (with the unmodified connectors slipping through their respective holes on the enclosure, then soldered the wires to the top of the PCB. With the wire lengths now assured to be the correct length I removed the PCB and completed soldering to the pads on both sides of the PCB. Finding the short on the port #8 actuator took a little detective work. First I examined the voltages and resistances on the working ports for comparison. This led me to conclude there was a short across the coil of the front relay in the chain. Since the relays are PCB mounted and the board is two-sided the fault had to be on the PCB traces under the relay body, in the relay itself or elsewhere. Lifting the relay is no simple feat. I decided to focus on the third option since relays of this style rarely fail in this manner and the PCB layout and soldering is generally clean. Excess solder flux along the board traces were removed to ensure no solder bridges were hiding beneath. With nothing found I was left with a capacitor and a diode to examine. The capacitor shunts RF from the control lead to ground and the diode across the coil protects against back EMF when the control voltage is removed. The capacitor checked okay so I lifted one end of the protection diode with a soldering iron. That solved the problem. The diode tested short. 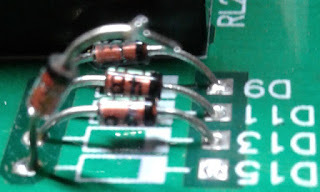 Look at the (fuzzy) picture for a close-up of the bank of back EMF protection diodes. From the package design and lettering it is evident these are 1N4148 switching diodes. They are not suitable for this application. The diode junction probably failed due to an unusually high voltage spike from the collapse of relay coil's magnetic field the diode is there to protect the circuit. I replaced the failed diode with a 1N4007 from my ample stock and all was good. I really should replace the other 7 protection diodes at some point but chose not to do so at this time. With the changes documented earlier the PCB can be quickly removed to do it when I am ready. With the unit reassembled I built a temporary wired connector (DE25) to apply power to the unit and a probe to ground the selector pins. With an ohmmeter I tested each port for continuity and equal low resistance value, then did the same for the other side of the switch. The PCB was then fully attached to the enclosure and again tested in the shack with real antennas and rigs. This test was for expected port isolation, SWR and receive and transmit performance. Before I began repairs I was concerned that one or more relay contacts had worn due to poor quality or hot switching with high transmitter power. The previous owner, like me, used a custom control unit that may not have had protection against hot switching. A TX enabled signal is available from most current transceivers that control units can use to prevent antenna switching while the transmitter is active. Luckily all the relays tested okay. Although these sealed DPDT PCB-mount relays have an industry standard form factor (2c) and are inexpensive it would be a lot of work to de-solder the 8 pins on each, and there are 24 of them. Plug compatible replacements that may be more available in North America include the Omron G2RL-24 with 12 VDC coils. I have not confirmed this so do your research before you replace one of the Tianbo relays. When that test was passed the enclosure was fully boxed and reinstalled at its outdoor location. It now performs flawlessly. Hopefully this time it will continue to work as it should. 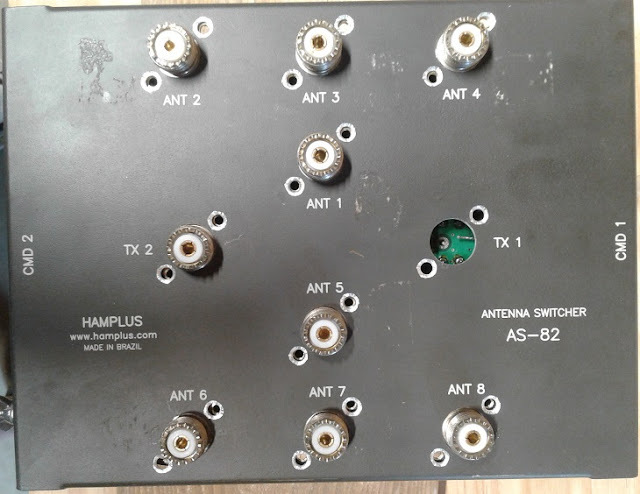 My purchase of the Hamplus AS-82 2×8 antenna switch was done on impulse to solve an immediate need. I did not want to buy new since it was the early days and I did not have a definitive plan for my antenna switching architecture, including physical layout, antenna/band hierarchy (flat or switching per band) and control system for SO2R or multi-op. I still need this switch as an interim solution for at least the coming winter contest season. The design of the AS-82 seems sound and when it works it works well. The PCB quality is excellent. What is not so excellent is its construction and parts selection. I expect better for the price. I also expect a schematic and detailed interfacing specs. I can only hope their other products are better built. Many of the big guns design their own switching systems, eschewing commercial products entirely. Others buy from among several available high-end systems, including those that support more than two operating positions. The small number of dedicated multi-multi stations have simpler requirements since each operating position is only concerned with selecting from one of a small number of dedicated mono-band antennas. As my station grows it is possible that the Hamplus switch or one very similar could form a core component of my switching system, supplemented with secondary switches for antennas on each band. The switching and control system design is ongoing. That is a subject that is very likely to appear in an article later this winter. 6 Meter Season Wrap-up: FT8 Conquers All!